Prime Minister of Turkey Ahmet Davutoglu. Ankara is expecting Moscow to approach the situation around the downed Sukhoi Su-24 with sangfroid, Turkish Prime Minister Ahmed Davutoglu told reporters after meeting with Azeri President Ilham Aliyev on Dec. 3. "At the meeting I informed the president of Azerbaijan about the events in Syria and the situation that arose after the plane was shot down on Nov. 24. We are expecting from our friend and neighbor Russia a cool and calm assessment of what is going on," Davutoglu said. Russian aircraft repeatedly violated Turkish borders, the prime minister said. "For us, the Turkish borders are sacred. On the other hand, there is no other country like Turkey that is so badly hit by Syria's problems. Turkey has 2 million refugees on whom it has spent $8 billion to date," Davutoglu said. Turkey lays no claim to Syrian territories, he said. "Turkey is ready to discuss any issue with Russia. Today the foreign ministers of Turkey and Russia are meeting in Belgrade. The only issue that is off-limits for us is our borders and sovereignty," the prime minister said. Turkey is not involved in economic sanctions against Iran and Russia, he said. 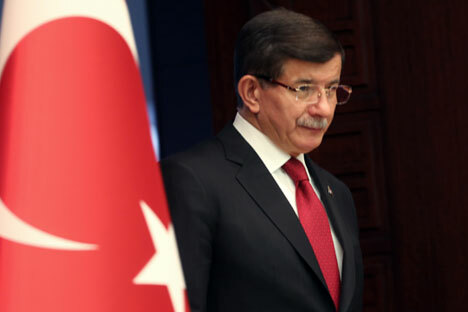 "However, we are surprised by Russia's application of an economic embargo against Turkey over an event for which Turkey has no blame," Davutoglu said. "We favor a discussion of the problem over the table. We won't accept unfounded accusations against Turkey. I reiterate that we will not let anyone make steps aimed at violating Turkey's borders," the prime minister said.